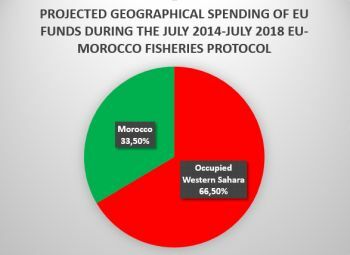 For a third consecutive year, Morocco has spent most of the EU’s fisheries sectoral support on further developing the fishing industry in occupied Western Sahara – with the explicit approval of the Union. As part of the Fisheries Protocol between the European Union and Morocco, the EU grants Morocco an annual €14 million as support for developing its fishing sector. But the Moroccan government spends the lion’s share of that support on expanding the fishing industry in the part of Western Sahara that it holds under military occupation since 1975. WSRW’s work is being read and used more than ever. But our financial situation is tough. Our work takes time, dedication and diligence. But we do it because we believe it matters – and we hope you do to. If everyone who reads our website or likes us on Facebook, would contribute to our work – 3€, 5€, 27€ … what you can spare – the future of WSRW would be much more secure. You can donate to WSRW in less than a minute here. This is evident from Morocco’s third annual sectoral expenditure report, "Rapport sur la mise en oeuvre de l'appui sectoriel au titre de la troisième année du Protocole", which WSRW has obtained a copy of. Download the report here. In December 2016, the Court of Justice of the European Union already ruled that since Western Sahara has a "separate and distinct" status to Morocco, no EU Trade or Association Agreement with Morocco can be applied to the territory. The only way for any such agreement to lawfully affect Western Sahara, is through obtaining the explicit consent of the people of the territory. But the EU is now turning a blind eye to that legal requirement, and has embarked on negotiations with Morocco to modify the trade deal so that it will incorporate Western Sahara. Morocco's report on its expenditure of EU funds illustrates the EU's absurdly different approach to the annexed territories of Palestine, Crimea and Western Sahara. When the Protocol expires, in July 2018, Morocco will have received a total amount of €56 million as fisheries sectoral support. By its own admission, the Moroccan government will have spent at least 66.5% of that amount - €37.27 million - in occupied Western Sahara. The report makes no mention of Western Sahara, as that is a taboo concept in Morocco. But the figures can be deduced from examining expenditure across the 12 administrative regions. Two of the 12 listed regions are located entirely in occupied Western Sahara; ‘Laayoune – Saguia El Hamra’ and ‘Dakhla – Oued Eddahab’, receiving respectively €10.21 million (18,2%) and €27.06 million (48,3%). The administrative region ‘Guelmim – Oued Noun’ overlaps the border between Morocco and Western Sahara, but to the eastern part, and as such probably doesn't accommodate any fisheries related activities. Click the above pie chart for a larger visual representation of Morocco's geographic expenditure of EU fisheries sectoral support. In this third annual report, Morocco applies for EU funding to be granted to 36 projects; 15 of those are located in occupied Western Sahara, and 13 are carried out at least in part in Western Sahara. Only 7 projects are to be carried out uniquely in Morocco proper, but two of those have been cancelled during the third year of the Protocol, and the funding that had been earmarked for those two projects (fishing towns in Tibouda and Tiguert) has been reallocated to other projects – mostly, again, projects located in Western Sahara. Finally, there is 1 project in a place called Amégriou, which is located right at the border between Western Sahara and Morocco. From what WSRW has understood, the project-site is located in Morocco proper. The number of projects that Morocco has implemented with EU support inside the occupied part of Western Sahara has gone up through the years. During the first operative year of the fish deal, Morocco requested funding for 25 projects, 10 of which were located in Western Sahara and an additional 10 were carried out in part in Western Sahara. Read more about how Morocco spent the EU's sectoral support during the first year of the fisheries agreement here. For the second operational year, Morocco applied for EU funding of 32 projects; 14 in Western Sahara, and 12 in part in Western Sahara. Read more about the projects funded during the second year of the Fisheries Protocol here. The European Commission is fully aware that it is funding Morocco’s fisheries projects in occupied Western Sahara. As stipulated in the Protocol to the Fisheries Partnership Agreement (FPA), the Moroccan government must first present the projects it would consider eligible for EU sectoral support; the EU Commission then needs to expressly agree to fund these projects in arrears. Once granted EU approval, Morocco can proceed with the implementation of the projects, and the EU reimburses one year down the line, in accordance with progress made. For instance, let's take an imagined example: The EU and Morocco have agreed to project X. Work on that project during the third year of the Protocol has been estimated to cost €100,000. By the end of the third year, Morocco reports a completion rate of 81%, and thus gets €81,000 refunded – the remaining €19,000 will be refunded once the corresponding costs have been made. So Morocco does not lose that money, but receives it once it has completed the work for which the sum had been earmarked. The inclusion of Western Sahara's waters in the EU's fish agreement with Morocco, is precisely what landed the deal on the agenda of the Court of Justice of the EU. The Court's Advocate General is expected to present an Opinion on one of the two cases pertaining to the Fisheries Protocol in mid-December. In response to the Judgment of the Court of Justice of the EU of December 2016, the EU Commission issued notice to the EU Member States' customs authorities, instructing them to no longer apply preferential treatment granted through the Morocco trade arrangement to products from Western Sahara. This mainly bears upon agricultural products, but also processed fisheries products - products coming from an industry that the EU is knowingly funding in occupied Western Sahara through a deal with Morocco. A full list of projects that were eligible for EU funding during the third operative year of the Protocol to the FPA can be found below. (Note: most of the monetary figures related to the projects have in this third report been expressed in Euro (€), though occasionally the report still uses DH (Dirham) or MDH (Million Dirham). Saharawi refugees receive 0.5 kg of fish per person, per month. These are the very people that had to flee the place where the EU now funds a freezing hall (Dakhla) that will house three icing factories with a joint-capacity of processing 125 tonnes of fish per day. As such, these factories can process in a single week the 900 tonnes of canned fish that the Saharawi refugees receive per year, courtesy of the Swedish government. The UN General Assembly has condemned Morocco's occupation of the Dakhla area, demanding Morocco to terminate the occupation. Motivated by the ever increasing landings in Dakhla, the port requires the establishment of a suitable market infrastructure, Morocco’s report to the EU Commission declares. The existing hall in down-town Dakhla can’t cope with the increased volumes and doesn’t allow for the fish to be preserved well. A new, state-of-the-art freezing hall located inside the port’s premises would tackle that. This hall would include a market place for fish to be sold, three icing factories with a capacity of 125 tonnes per day, offices, cold rooms and fittings, etc. The total cost of the project is now estimated at €4.1 million (up from an initial estimate of €4 million), of which €333,000 is reported to have been programmed for the third year of the Protocol. The bulk of the required investment has already been made during the first year of the Protocol. The project has been 81% completed. Morocco thus applies for €277,000 to be unlocked for the fourth year of the Protocol. Ironically, the project is lagging behind because the freezing factories lack the necessary permit “from the competent authorities”. Aftiessat is a small town located 65 kilometers south of Boujdour, along the mid-coast of occupied Western Sahara. A few years ago, Morocco’s Department for Maritime Fisheries adopted a program to build fishing towns and landing points along the coast of Morocco and occupied Western Sahara. In 2012, the landing point of Aftiessat was created; a 39 hectare area that includes a fishing zone, a residential area for fishermen, a workshop for reparations, a hospital, restaurant, mosque and classroom. According to Morocco’s report, 1.750 people live here. The Moroccan government is using EU funding to provide the Aftiessat landing point with solar energy equipment for electricity supply. This comes at a price-tag of €635,000. The bulk of the investment having been carried out during the first operational year of the Protocol, Morocco had budgeted €31,000 EU support during the third year which has all been used up. It thus asks for €31,000 to be reimbursed during the fourth year of the FPA. Lamhiriz is a small town located 318 kilometers south of Dakhla, in the Bir Guendouz area. The landing point here was created in 2009, and contains a fishing zone that includes a fish hall and fishermen cabins, a doctor’s clinic, commercial center, primary school, workshop for boats, etc. Morocco’s report claims that 378 people live here. With the EU sectoral support, Morocco wants to supply the Lamhiriz fishing town with solar energy. The project was estimated to cost €544,000. During the first year of the fisheries protocol’s implementation, €371,000 was spent on this project. Given the completion rate, Morocco now applies for €61,000 to be reimbursed for work carried out in the third operational year of the Protocol. The project would entail the creation of a 3,000m² area dedicated to artisanal fisheries inside the port of Boujdour, on the mid-coast of occupied Western Sahara. Included would be 760 fishermen cabins, a workshop for boat and mechanical reparations, two restroom areas, etc. The project would cost 30 MDH (€2.7 million), of which 20.7 MDH (€1.9 million) has been earmarked as EU sectoral support. The project has experienced significant delays during the first operational year of the Protocol, for which an 11.4 MDH of EU sectoral support had been allocated. The Moroccan government has an agreement with the EU to spend the remaining 9.3 MDH on other projects – though it doesn’t specify which projects in this report. For the third year of the Protocol, the Moroccan government does not apply for funding for the initial project. The Moroccan government wants to create a logistics platform for aquaculture in the Bay of Cintra, 150 kilometers south of Dakhla. The zones that are available for aquaculture require a landing infrastructure, consisting of a floating bridge, administrative offices, maintenance and storage areas, purification stations, etc. The project requires 40 MDH in total, out of which €2 million will come from EU sectoral support. For the third operational year of the Protocol, Morocco had programmed €643,000. The project’s implementation is lagging behind due to lengthy studies aimed at identifying the precise location for the platform. Morocco thus asks for reimbursement of a smaller amount: €556,000. A proposed laboratory, specializing in aquaculture, will be composed of a research unit for shell fish, a research unit for fish, and a standard laboratory for an estimated cost of €1.82 million. During the third year of EU sectoral support, €326,000 had been budgeted for project development. The project experiences several delays, and is at present considered 86% on track - explaining why Morocco is applying for a smaller amount, €280,000, to be freed up now. The farm would be located offshore of an as-yet unidentified area, and would contain one lot designated for shell fish and another for fin fish. The shell fish lots consists of two floating rafts and six submersible cages of 200m each. The fin fish lot will consist of six floating cages of 12 m diameter. The project is said to need a total investment of an estimated € 454,000, of the bulk of which was already invested during the first year of the EU-Morocco fisheries partnership protocol. Between July 2016 and July 2017, Morocco had programmed another €17,000 for this particular project. That was completely used up, and thus Morocco demands the full amount, €17,000, to be repaid. A CAPI, short for Comptoir d’Agréage du Poisson Industriel, is a space where pelagic fish are sold to the processing industry and comes at an estimated cost of €308,000. The EU sectoral support will not fund the entire construction, but will provide €164,000 to that objective. The CAPI in Dakhla has been fully established during the first operational year of the Protocol. As such, Morocco applies for a quarter of the EU’s promised sectoral support to be freed for the fourth consecutive year; €40,000. This to reimburse Morocco for investing its own money in the completion of the project. A space for selling pelagic fish to the processing industry, similar to the one planned for Dakhla (see above °8), is reported to require €191,000 through EU provided funding. The CAPI in El Aaiun has been fully established during the first operational year of the Protocol. As such, Morocco now applies €40,000 to be released during the fourth year of the Protocol, as reimbursement for investing its own money in the completion of the project. This project will include the reorganization of the current hall, construction of a cold room, offices and a sales area, and the necessary equipment to transport the fish products. To complete the project, the Moroccan government will use €136,000 granted as EU sectoral support. The fish hall overhaul has been fully achieved during the first year of the Protocol’s implementation, and the bulk of the money has been paid out by the EU at that time. Accordingly, Morocco applies for the remainder: €3000 to be reimbursed for the third year of the Protocol and another €3000 to be released at the end of the fourth year. The project consists of purchasing weighing and surveillance equipment to be employed in the port of Dakhla. The project would cost €3.63 million, to be financed completely by EU sectoral support. Note that under the FPA, EU vessels have a landing obligation; they need to leave certain percentages of their locally caught fish (amount depending on the species) in the nearby ports. These catches are then sold to the local fish processing industry. Morocco asks for €673,000 EU funding to be paid for work carried out during the third operative year of the FPA. This progamme consists of six projects chosen by the Moroccan government that grant private operators fishing opportunities in return for constructing processing units in a newly developed industrial zone, located at the port’s entry road. The works are reported to cost MD 431 million. The EU would cough up MD 30 million, or €2.77 million. For the third operative year of the FPA, Morocco had budgeted €2.12 million. Due to delays tied to the installation of electric groups, the project is estimated to be 76% completed. As such, Morocco asks for a reimbursement of €1.62 million. The chosen fishermen towns are Labouirda (140km south of Dakhla), Ain Beida (60 km south of Dakhla) and N’tireft (60 km north of Dakhla). Labouirda will be equipped with housing, petrol storage space and shops. Ain Beida will be endowed with petrol storage and shops, while N’tireft gets housing and shops. The original proposal included 2 other fishermen towns (Tarouma and Agti El Ghazi – both also in Western Sahara – which have been swapped for Ain Beida and N’tireft). The change to the project comes at a higher expense than originally anticipated; from MD 35.2 million to MD 57.6 million (€5.43 million). The change of plans has delayed implementation, now foreseen for the 2017-2022 timeframe. Morocco now asks the EU to provide €2.73 million to reimburse work done in the third year of the FPA. The project consists of equipping the Institute of Maritime Fisheries Technology in El Aaiun with a pedagogic tool; a fisheries and navigation simulator. The project comes at a price tag of €362,000, to be fully paid by the EU. For the third year, Morocco had budgeted €74,000. As project-completion is 26%, Morocco applies for €19,000 to be freed up. The Institute of Maritime Fisheries Technology in El Aaiun will be equipped with a longliner ship of a length of 20m that will be used for formational purposes. The vessel will cost €1.27 million. For the third year of the Protocol, €259,000 EU support had been programmed. Morocco applies for €79,000 to be reimbursed now – a relatively small amount, explained for by procedural delays in the project. There is one project which is located precisely on the border of Morocco and Western Sahara, in the fishing town of Amégriou. With EU funding, the Moroccan government wants to construct a fish hall here that is worth €274,000. One third of that estimated amount has been spent during the first year of the EU-Morocco fisheries protocol. Another €106,000 was programmed for the third year, but due to the project’s delay, Morocco does not yet apply for the money to be transferred. From what WSRW has been able to establish, the project-site is located just north of the border. The washing tunnels are framed as part of a strategy to better preserve fish. In its first report, in 2015, Morocco indicated it wanted to install automatic washing tunnels in four ports; Dakhla, Boujdour, El Aaiun (all in Western Sahara) and in Tan Tan, located in south Morocco. Its third consecutive report still talks of “four envisioned ports” but only mentions El Aaiun and two washing tunnels in Dakhla. It is unclear to WSRW whether the supposedly envisioned fourth port is Tan Tan or Boujdour, or whether both have been dropped and replaced by another location. More plastic boxes containing freshly caught fish could be washed with the washing tunnel-systems, allowing for 120,000 boxes a day to be processed. The project, encompassing the tunnel systems for all four harbours, would cost €1.27 million. Morocco had programmed €267,000 EU support for the third year. As only 73% of the project was completed during the third year, it applies for €194,000 to now be transferred. This project consists of the construction of storage facilities in the harbours of El Aaiun, Boujdour, Dakhla (all in Western Sahara) and Tan Tan in Morocco proper. The Moroccan reports states that these ports don’t have sufficient storage space for the volumes of fish that pass through every day. The enlarged storage space in all four ports would come at a total cost of €1.45 million. Around €1 million has been used to implement the project during the first operative year of the current EU-Morocco fish protocol. For the third year, Morocco had budgeted €64,000 EU support, and it applies for that amount to be freed up now. This project initially contemplated building walls around the harbour premises of 9 ports. Last year, that number was increased to 14 ports. Four out of the 14 project-locations are in occupied Western Sahara; Boujdour, El Aaiun, Dakhla and Ain Beida. During the first year, the Moroccan government did not mention Ain Beida, but reported it would build walls around the port Lamhiriz, which is in Western Sahara. Ever since, there has been no mention of Lamhiriz, but only of Ain Beida. It is unclear to WSRW whether the prefab wall construction in Lamhiriz has been finished, or whether the idea has been abandoned. The report reads that the entire project has been completed, and all walls have been erected in the cited locations. The total cost to carry out the project in all nine locations is estimated at €1.43 million, of which €977,000 had already been spent during the first year of the Protocol. For the third operational year of the Protocol, the Moroccan government had allocated €32,000 under this project header as EU support, and now applies for amount to be released. Dubbed “offshore exploration campaign” in the previous report, the price tag of this particular project had risen from €3,620,000 to €5,435,000 by the second operational year of the Protocol – though the content appears unmodified. This research project intends to review different fisheries stocks. 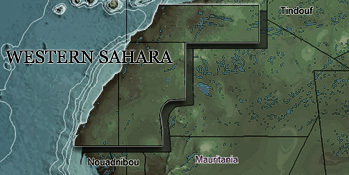 In practice, the Moroccan and Western Sahara waters are divided in three sectors for research-purposes. Sector one encompasses Morocco’s Mediterranean coastal waters and most of its Atlantic waters; sector two encompasses all of Western Sahara’s territorial waters and a small part of Morocco’s southernmost waters (from Sidi Ifni to the Western Sahara border); sector three is a cut-out of sector 2, incorporating the southern half of Western Sahara’s waters. 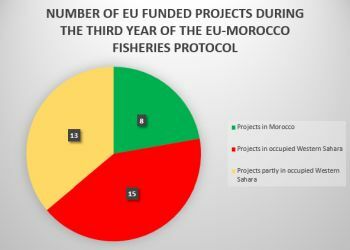 Morocco had budgeted €295,000 of EU funding for the third year of the Fisheries Protocol. As the project appears to be on track, it has asked for that amount to be reimbursed by the EU now. Morocco’s National Marine Research Institute (INRH) requires €1,09 million for an observation system to build up scientific knowledge about the marine resources in Moroccan (and occupied) waters. During the third year of the Protocol, INRH has estimated to use €87,000 to this purpose. Due to project-delays, only €79,000 of EU funding is requested to be repaid. The project consists of forklifts, trucks and other transport equipment for the ports of El Aaiun, Dakhla, Boujdour (all in Western Sahara) and Tarfaya and Tan Tan in Morocco proper. The Moroccan report projects €365,000 is needed to buy the necessary equipment. All equipment has been obtained during the second operational year of the Protocol. As such, Morocco is now applying for reimbursement of its own investment: €15,000 for the third year. The Moroccan report cites “a lack of knowledge about nature and about the marine resources”, “the absence of a management plan for these marine resources” and want to take that on by developing an inventory system that would cost € 3.62 million. Between July 2016 and July 2017, Morocco had budgeted €184,000 of that total amount. As the project is on track, it asks for full reimbursement of that sum. At the expense of €547,000, Morocco’s National Marine Research Institute wants to harmonize the fish capacity and systems of its national fleet with the marine resources’ potential. To this purpose, it wants to take inventory of the fleet, study the used fish gear, and evaluate capacity of each fishing unit. During year three of the Protocol, Morocco used €58,000 used to that purpose, and now asks the EU to refund that sum. In return for €2 million the Moroccan government will sensitize “the populations” about sustainable fisheries. The current report lists nine associations as beneficiaries of the support during the second operational year of the FPA: the National Confederation of Artisanal Fisheries, Moroccan Confederation of Coastal Fisheries, National Confederation of Coastal Fisheries, General Confederation of Enterprises in Morocco, Federation of Maritime Chambers, Chamber of Maritime Fisheries in the Mediterranean, Chamber of Maritime Fisheries of the North Atlantic, Chamber of Maritime Fisheries of Center-Atlantic, and Chamber of Maritime Fisheries of the South-Atlantic. According to the report, a total amount of €1.5 million had been granted to the nine organisations by July 2017. Morocco asks to be paid €279,000 EU sectoral support, which was budgeted under this project header for the period between July 2016 and July 2017. All vehicles have already been purchased during the first operational year of the Protocol. Of the 20 vehicles, 5 will be deployed in Western Sahara. One vehicle is assigned to each of the 18 ports listed, with the exception of Dakhla, which will be equipped with three vehicles. Morocco had not budgeted any EU funding for the third or fourth year, and is thus not applying for any money to be freed up for this particular project. The lack of knowledge about species living in these particular areas, triggers the Moroccan government to undertake this project, which consists of renting a longliner, obtaining necessary scientific equipment and undertake inspection campaigns. Presumably this project will also be carried out in Western Sahara, as the targeted fish categories include stocks present in the territory’s waters. The project will cost €725,000. Morocco had budgeted €54,000 for the FPA’s third operative year, and requests full reimbursement as the project is on track. This project was initiated during the second year of the Protocol, and originally consisted of upgrading 18 health posts, where fishermen will be tested to see whether they are fit for the job and where they can receive first-aid care. In the current report, Morocco only talks of 17 health posts. No reason is given for reducing the scope of the project. Also missing are the exact locations for the health posts, but pictures of the health post in Boujdour are included. The entire project will come at an expense of €365,000, of which €50.000 had been programmed for the third year of the FPA. The project is lagging behind, and as such, Morocco requests €28,000 to be freed up for made costs. This project kicked off during the second year of the Protocol and will be carried out in 15 to 20 locations (not yet specified) along the coastline of Morocco and thus probably also Western Sahara. Fishermen will receive a training to monitor species and stocks. The project will cost €634,000. Morocco had programmed €220,000 EU funding for the third year, and is asking a full refund.